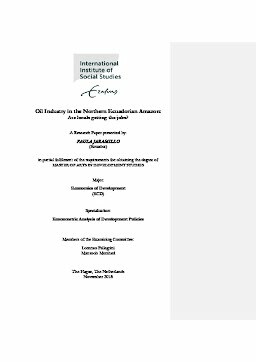 Erasmus University Thesis Repository: Oil industry in the Northern Ecuadorian Amazon: are locals getting the jobs? Oil industry in the Northern Ecuadorian Amazon: are locals getting the jobs? This paper assesses the impact oil companies in the Northern Ecuadorian Amazon have on the local communities in the form of direct employment generation. For such objective, the study analyses the level of employment as well as the characteristics as oil workers from the communities through the use of a household survey conducted in 60 rural localities of Sucumbios and Orellana in 2016. The data is complemented with the National Survey of Employment of Unemployment and Underemployment from the same year. The results of the survey show that only 6.4% of the working-age population in the local communities worked for oil companies, mainly performing unskilled tasked. Of them, only 12.1% were women and 5.1% indigenous. There is evidence of higher levels of unemploy-ment in these communities in comparison to other rural areas of the same provinces. Fur-thermore, the results of a logit model on employability in the oil sector suggest that education does not play a role in increasing the probability of employment in an oil company.